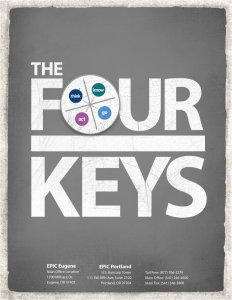 The Four Keys Reference Guide was developed to support educators in understanding and using the Four Keys to College and Career Readiness. Based on over a decade of research and 20 years of experience in the public education system, Dr. David T. Conley developed the Four Keys so students, families, and educators can identify and prioritize the skills that are needed to be successful after high school. In it’s simplest form, we refer to the Four Keys as THINK, KNOW, ACT, and GO. In order to prepare students to be lifelong learners, they need the ability to THINK deeply about what they are doing; KNOW contextually why they learn; ACT purposefully to achieve their goals; and GO successfully through life’s transitions.